People who wear dentures sometimes lose them, as you might mislay a pair of glasses, but it’s rare to do it in quite this fashion. This case, from the 1842 volume of Guy’s Hospital Reports, was reported by one W.G. Carpenter. Mr. H., aged 35, the subject of the present case, was an Assistant to Mr. Watts, an extensive chemist in the Edgware Road, with whom he had resided for upwards of eight years. Mr. H was afflicted from childhood with asthmatic bronchitis; and it appears that several branches of his family have fallen victims to pleuritic, pulmonic, or tracheal affections. Broadly, respiratory infections: those affecting the windpipe, the lungs or the membrane surrounding them. With the exception of an occasional attack of increased difficulty of breathing, nothing which attracted particular notice seems to have occurred during the early part of his residence with his last employer; although, from the curious facts that were brought to light in the post-mortem examination, I think he must have suffered more or less for some years past; but his high flow of spirits, and his devoted attachment to business, were perhaps the means of diverting his attention from his own state of health. I first became acquainted with him in the early part of last winter. I never found him free from fever: his pulse was always above 100, skin hot, with other symptoms of inflammatory action. On Friday the 13th of April I received a note from him, requesting me to call, as he had been attacked with pain in the side and chest, which had that evening become so acute as to render coughing, speaking, and breathing, almost impossible. I immediately visited him. He complained of an acute pain in the right side of the chest shooting up to the clavicle, increased upon deep inspiration: respiration short, and hurried: pulse 140, rather wiry: skin hot and dry: tongue furred at the base and margin, red in the centre: bowels confined: cough troublesome. After listening to his chest the doctor concluded that there was an infection of the right lung: breathing sounds on that side were inaudible. Considering the case one of active inflammation, I bled him from the arm to eight ounces, without inducing syncope [fainting]: this relieved him of pain: he could then breathe with more freedom, and said that blood-letting was always of service to him. I ordered him some calomel, antimony, and compound extract of colocynth, to be taken at bed-time. An enema of gruel and olive-oil to be administered immediately. Diet to be more generous: some port-wine to be given occasionally throughout the day, with good beef-tea. A few days later matters came to a head. I had prepared the requisites for administering an enema, to relieve the abdomen and allow its muscles more freedom of action; and had left him for a few seconds, to get some wine which he might take as a support through the operation, when I was summoned up to his room, as he had become very restless. I went immediately, but only to see him breathe his last. The following day Dr Carpenter and another colleague performed a post mortem. They opened the man’s chest to look at the lungs. As soon as I passed the scalpel into the right pleura, a gush of very offensive gas escaped. The pleural cavity on this side contained five pints of sero-purulent fluid. Thin yellow pus, in other words. Just try to imagine what five pints of the stuff would look like. After I had completed the examination, I was removing the remaining fluid and coagula of blood that had escaped from the pulmonary vessels to replace the lung, when I came to an irregular substance, which, when examined, turned out to be, to our great astonishment, a piece of ivory worked into four artificial front teeth, covered with a brownish crust, with a pointed piece of silver riveted into the upper part of the teeth, which had evidently assisted in fixing them to the upper jaw; the base of the silver rivet surrounded with wadding. At each extremity there are two holes, which no doubt once contained the wire that fixed this mass of false teeth to the adjoining sound ones. These false teeth were not in the stomach or intestines, but in the chest cavity! How on earth had they got there? The father of Mr. H being in the house at the time, was referred to about the teeth; and he immediately exclaimed, that his son swallowed them thirteen years ago, in a fit of coughing, during his apprenticeship. I again examined the oesophagus; and we were satisfied that there was neither a recent wound nor a cicatrix [scar] to be found; and the only opening through which it could have escaped into the pleura of the right thoracic cavity, where I found it, must have been the fistulous [anomalous] one in the corresponding lung. The doctor realised that a set of false teeth lodged in the lung would probably be intensely painful, so asked whether the patient had been in serious distress; but apparently not. The morning after it happened, he mentioned the circumstance to Mr. Champley, his master, who advised him to take an aperient, supposing the teeth had passed into the stomach: it was thought that the teeth had passed away by the bowels, unnoticed;—and then the circumstance gradually became forgotten. He had been subject, from a child, to asthmatic bronchitis, which perhaps, from the constant, efforts at breathing, had dilated the air-passages, and, with the coating of mucus that no doubt existed, might have rendered the parts somewhat insensible. Dr Carpenter concluded that the patient had managed to inhale the denture, that it had entered the lung and then worked its way through the wall of the organ before lodging inside the pleura. He noted that one of the false teeth was still quite sharp, which might have created the opening he observed. It all seems rather unlikely (you’d expect such a major injury to have caused serious bleeding and altogether more dramatic symptoms), but it’s difficult to explain the case any other way. 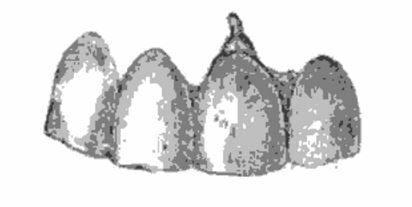 What is particularly remarkable about the case – whatever the explanation – is that the teeth remained in situ for thirteen years before the patient’s death. The teeth are now in the possession of Mr. Carpenter, West Street, Finsbury Circus. Where I’m sure he received a steady stream of visitors eager to see them.